Omnitrans’ fixed-route buses have returned to their original stops on University Pkwy. Just in time for the start of the new school year, construction crews for the Griffith/Comet Joint Venture are wrapping up work on the new road and station platform for the sbX bus rapid transit service that will begin serving California State University, San Bernardino in early 2014. During the past few months of construction of the sbX project on campus, Omnitrans fixed route buses were moved to two separate locations on campus. Temporary stops were located along sidewalks near the campus bookstore and near the recreational center at the end of Coyote Drive, while crews worked on tree and landscape removals grading and paving of a road that leads up to the new station platform near the information kiosk on University Parkway. Now that most of the work has been completed buses have been allowed to return to their original stops on the turnaround. Crews will continue working on electrical and other construction activities at the platform beyond the September 24 start of the fall quarter. The good news is that construction-related impacts will be minor to campus visitors as traffic control measures will be in place to keep vehicles safely away from workers. 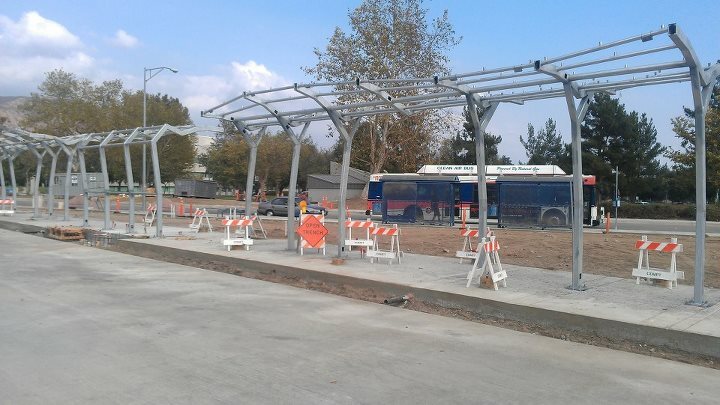 This entry was posted in sbX construction and tagged brt san bernardino, bus rapid transit san bernardino, omnitrans news, omnitrans sbx, sbx construction, sbx rapid transit. Bookmark the permalink.